Extension function allows us to extend the functionality of a class. It does not matter if the class is in a external library. We can customize the functionality of class with out making changes to it. At first these extension functions seems confusing for Java programmers but going though some examples should help in understanding it. 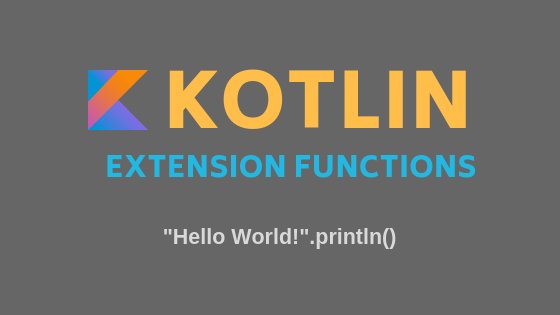 <2> println function is not part of String class but we are calling extension function. <3> Declared an extension function on String class. More about this in the next section. To declare an extension function we need to prefix function name with receiver type separating with dot like below. Based on our example we created an extension function on String so we declared it as fun String.println(). We are saying that String is the receiver type and println is the extension function name. Now we can call println on any String objects in my project if I have this declaration in the class path and this function will print the message to console. <1> Receiver type is passed as the argument to the extension function. This is the reason we can use this in the extension function to refer the receiver. If extension function println needs to take arguments then those arguments are appended after the receiver type in the function implementation. Lets assume we have a class Animal in a third party library. In below code I created a extended function to add more functionality to it and extended function takes one argument. <1> Animal class is part of third party library so we can not change it. <3> Creating animal object and calling eat() and extension function run(). This example shows that we can add arguments to the external functions. Extension functions not only just for Java core classes, we can add them for even third party libraries. But make sure to not overuse it because they may create ambiguity in the project so some policies may be needed in the project to create and maintain extension functions.